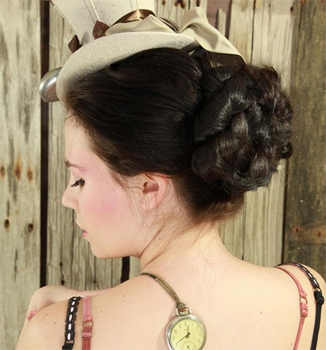 There are no actual definitions of steampunk hairstyles just like the fanciful steampunk era. The main object of these hairstyles is to give a vintage look, blending with scientific fantasy. Thereby, it opens up numerous possibilities for one to attain this look. They can be blended with any classical hairstyle; all you have to do is wear them in a little modern way. Finger waves, bouffant, pompadour, up-dos, loose curls are all suitable for this category. A pair of goggles is the most important accessory for this style and can be used differently for a more improvising presence. Unique, neon colors with colorful ribbons are also appropriate to don the alternative Victorian or American “Wild West” looks.